In 1939, Winston Churchill described Russia as a “riddle wrapped in a mystery inside an enigma”. When it comes to the MacRae film of the Loch Ness Monster, this seems an apt term for the riddle of a mysterious film of an enigmatic object. If you stumbled across this article seeking information on the clan of MacRae or McRae or perhaps sought information on matters pertaining to history, genealogy, tartan and ancestry, you may well get some, but it comes with a tale of monsters, claims and counter claims. But why should anyone be bothered about a film that has never seen the light of day? Why should it be a forum for debate? The answer lies in what it claims to offer – undisputed proof of the Loch Ness Monster. It was what Loch Ness author, F. W. Holiday, held up as the “most sensational wildlife film of all time”. If that was true, it would be a matter worth pursing and indeed a sizable number have pursued this Holy Grail of Loch Ness Monsterism with the zeal of medieval knights. But like the knights of old, the grail has not come to Camelot and various legends have perhaps grown to fill the void. Fifty years on, since this story first came to light, it would seem appropriate to review what has gone before us and what could lie beyond in the unwritten future. The players in this tale are varied, but all with the same intention of arriving at the truth of the matter. The people that have contributed to what we know include Ted holiday, Mike Dash, Paul Harrison and Alan Wilkins. There will be others, but these are the ones we focus on today. I will add my own observations at the end, so I am more the editor rather than the creator of information for now. We would not have known anything about the McRae film if it was not for Ted Holiday, maverick Nessie researcher of the 60s and 70s, who revealed the possibility of this game changing film in his 1968 book, “The Great Orm of Loch Ness”. In the chapter entitled, “Expedition '65”, Holiday tells us of his trip to Loch Ness in 1965 and an unexpected end to that particular expedition. The evening before he left, he was informed of a man named Alastair Dallas, who had knowledge of not one but two extraordinary films. Armed with this information, Holiday stopped off on his way back to Wales, in the small Borders town of Kircudbright, where Mr. Dallas lived. Initially, he was not well received by Dallas who was surprised that he was in possession of such information. However, once Holiday had convinced him of his pro-monster credentials, he relented somewhat and told the story of the two films which had both been taken in the 1930s by a Doctor MacRae. The physician had retired to the shores of Loch Duich and was now deceased. But before his death he had captured two animals on two separate sequences of film. Mr. Dallas told me that this film runs for several minutes. Three humps, together with the neck and head, are clearly visible. The neck is held low over the water and seems to be writhing to and fro. During the sequence, a bird flies down and lands on a stone in the foreground, which helps to give scale to the picture. The Orm's head appears to be bluntly conical in profile - rather like half a rugger ball, to quote Mr Dallas. On the crest of the head are two hornlike sense-organs. Starting between these, and running down the neck, is a bristly mane. Mr Dallas said that this mane reminded him of baleen; it is stiff yet flexible and the texture seemed to him fibrous rather than hairy. Slit-like eyes can be made out on the head but they are not very distinct. Occasionally, the animal, rolls in the water and one of the forward flippers makes an appearance. It is thick and fleshy in section and seems to be capable of independent movement. The skin looks tough and leathery. Another interesting feature is the fact that the head seems to be in a state of continuous flux or movement, apparently due to the play of muscles under the skin. The second film, which was also taken by Dr McRae, shows a creature lying in Loch Duich - a sea-loch on the Scottish west coast. The monster is lying against the shore and is writhing its neck over a bed of seaweed. It differs from the Loch Ness specimen in having a longer neck and a mane which looks tufted. A man appears in the picture during this sequence, probably in the background. With both being shot at a range of about one hundred yards, the attraction of pursuing this matter further was not a difficult decision. However, Alastair Dallas brought the whole thing to a screeching halt with the claim that Doctor MacRae had decided to leave the films in an unnamed bank vault in a safety deposit box and put them under a legal trust until such time as the matter of the monster was taken more seriously. One of the trustees was Dallas himself, the other was the late Colonel Sir Donald Cameron of Locheil and the third trustee he refused to name (presumably because he or she was still alive). It was only because the terms of the trust did not forbid a description of the film that allowed Dallas to relate the episode to Holiday. Beyond that, Dallas was not prepared to go further. After leaving Scotland, Holiday followed up the matter with the present Donald Cameron of Locheil who denied any knowledge of the films. Further letters to Alastair Dallas went unanswered and Ted Holiday concluded he could take the matter no further. Apart from a reference by Roy Mackal, it was not until the late 1990s that the matter was taken up again in the research of Mike Dash and Paul Harrison. By coincidence, they had both resolved to see if anything extra could be gleaned from this almost mythical tale of monsters. At this point, I defer to a talk given by Mike Dash to the Weird Weekend convention in 2008 where he laid out his findings and conclusions to the audience. You can find the talk here and I thank Mike and Paul for their permission to use material for this article. The first question to answer was whether Dr. MacRae ever existed. Mike Dash is quite certain the answer to that question is “Yes”. Using Holiday’s statement about the doctor retiring to the shores of Loch Duich and armed with the Medical Register for that period, he was able to whittle down the various medical MacRaes to a Farquhar MacRae who lived in the village of Ratagan by the shore of Loch Duich. Using various sources, Mike pieced together a life of the man who it is claimed filmed the best evidence ever for the Loch Ness Monster. Further research by Mike revealed nothing in the wills of MacRae or Cameron of Locheil. However, he uncovered a photograph of Farquhar MacRae taken from Volume 7 of the Celtic Monthly published in 1899 which is shown below. Interestingly, Mike also found some wax cylinders from 1908 held by the British Sound Archive in which McRae sings some Gaelic folk songs! So, it seems certain that the man existed as described by Alastair Dallas. But, he had died childless in 1948. Would it be possible to find any living relatives to ask awkward questions about the Loch Ness Monster? The answer was again “Yes” and this involved the parallel research of Paul Harrison who had placed adverts in papers asking for information on the film. This led to the great-niece of Farquhar MacRae, but she refused to discuss the matter saying there was nothing to it. However, her daughter, Fiona MacRae was a bit more forthcoming in two letters to Paul in 1998. Farquhar MacRae was born in Lochalsh, December 1855, he died in 1948 and is buried with his father in Kirkston of Lochalsh. He was unmarried. I have heard a story about photographs, not film, that he had taken of the Loch Ness Monster, but know nothing of their whereabouts. Farquhar MacRae was a cousin of my husband's grandfather. As far as we remember, the film/photo story came to us from his uncle, who died some 30 years ago. I am sorry I can't tell you more. A rumour has appeared in the Inverness area that Dr F. made a film of the Loch Ness Monster, and that it was stored in a bank on his death. It's not known where he banked in his later years - could be a London bank. Dr Mary makes light of the rumour, so I wouldn't worry much about it. Dr. Mary was the mother of the aforementioned Fiona MacRae. Both are tantalising pieces of information, though one might try and argue that the Jack MacRae rumours were a result of Holiday's book rather than an independent source. These accounts might add some weight to the veracity of the story, but, ultimately, do not really take us much further forward. However, another player enters the stage when Roy Mackal wrote his 1976 book, "The Monsters of Loch Ness". In discussing the MacRae film, he mentions the work of researcher, Alan Wilkins. This is a name which some readers may recall as he was credited with taking a somewhat grainy film of Nessie back in 1975. In fact, I still recall seeing the pictures as a teenager, having cut it out for my clippings collection. Mackal informs us that Wilkins was told by Dallas that he disputed the account by Holiday and said there was no trust, only one film taken at Loch Duich and he did not know where this was. As a result of this confusion, Mackal declares the film "unacceptable as evidence". Mike Dash pursued the matter further in the 1990s and added some detail when he spoke to Wilkins by phone. When Wilkins made contact with Dallas in 1974, unlike Holiday, he was refused an audience. According to Mike Dash, parley was eventually granted, but only through an intermediary whom Dallas knew, by the name of Tom Skinner. Skinner relayed Dallas’ answers back to Wilkins and they painted a different picture to the one presented in Holiday’s book. According to this interview with Dallas, there was only one film and it had been taken at Loch Duich, and it was not as clear as originally claimed. The purported Loch Ness film was actually a sighting Dallas had himself of Nessie on land in September 1936. Dallas claimed that Holiday had completely twisted his original story. Dallas provided a basic sketch to Wilkins of the creature he claimed to have seen half out of the water in the 1930s. He then later sent what he said was a contemporary sketch and is shown below. I have covered this report before and it is a rather strange creature with multiple dorsal fins, droopy ear like structures and a mouth apparently sucking on a rock. Mike Dash was quite convinced that this was indeed warped by Holiday and did a point by point comparison of the creature described in the Loch Ness film above with the Dallas drawing. We have no record of Holiday’s reply to this accusation, but like Holiday before him, Wilkins closed the case and moved on. Around this time, Mike Dash made contact with Alastair Dallas’ son and put again the questions to him that Holiday and Wilkins had done before. In a now familiar refrain, his son denied any knowledge of any such film and suggested that his father had made up the whole thing and suggested there was nothing to see here and move on. He told them his father had a penchant for tall tales and this was likely one of those tales. And there our tale of sensational films of mysterious monsters grinds to a halt. What are we to make of it all? Is it an artist’s fantasy from the Borders, unwittingly aided by an over-zealous monster hunter? Indeed, as Mike Dash points out, the idea of a trust with no obvious beneficiary seems ill conceived. Nor is it likely to be a vehicle which could legally carry on in perpetuity. All the supposed trustees must be dead now, so where is the film now? Does it lie languishing in a bank vault, outlasting its protectors? In fact, how could it lie in a vault if no one is paying the annual fees for such a service? Moreover, the presence of a trust presupposes a solicitor, so what was their duty should all the trustees die? During the course of Mike's research, he stumbled upon a further conundrum. Farquhar MacRae succeeded a Farquhar Matheson as President of the Gael Society of London. So what, you may ask? As it turns out, Matheson had a famous sighting of a sea serpent back in 1893 in the Kyle of Lochalsh near Loch Duich. In fact, the Farquhars were both ENT doctors, both from the same distant parish and both are buried in the same cemetery in nearby Glenelg! Is it just coincidence that two Farquhars who were sequential Gaelic Society Presidents also had experiences of sea serpents? Mike Dash thinks this synchronicity might mean something, but can't come to a compelling conclusion. A contemporary drawing of Matheson's sighting is shown below. The conclusion of the researchers is that there is nothing or little of substance to the Loch Ness story, though there is still held out the hope of some kind of film or photograph of something in Loch Duich, though not as sensational as first made out. Indeed, to recall the Grail metaphor in the context of an Indiana Jones film, this Holy Grail may yet turn out to be no more than an unappealing cup. Gathering everything together, this is a case which has always proved an entertaining diversion for me as I speculated where that McRae film may or may not be. Back in the 1960s, researchers would have been more focused on the various hi-tech experiments at the loch and would have been confident that their work would render a 30 year old film surplus to requirements. With the failures of the 1960s and 70s, researchers took a fresh look at the legendary film. I did some digging around myself, albeit aware that the aforementioned researchers had already done a lot of the digging for the Nessie community. The first thing is the alleged twisting of the story by Holiday. To recap, Dallas told Wilkins (via Skinner) that Holiday had screwed up and confused his own sighting with a presumed film taken at Loch Ness by MacRae. Now since we are told by Dallas' own son that he was prone to telling tall tales, one wonders whether Dallas is the one screwing things up? Reading Holiday's account, it is clear that he mentions not only the two films, but also the Dallas sighting. So it seems Holiday did distinguish between the three events without any conflation. Indeed, it is hard to imagine how Holiday could confuse the story that much. Mike Dash compares the Dallas sighting with the Holiday description of the Loch Ness film and thinks there are parallels which suggest conflation of stories. I am not so convinced by that. Indeed, one could argue that the description of the Loch Duich creature correlates more with Dallas' own sighting. Note how the Duich creature is described as lying on the shore, just like the Dallas land sighting. It could be argued that Holiday was confusing this rather than the other. But, if Dallas was a tall tale teller, why trust him ahead of Holiday? On the other hand, if Dallas was lying, how did he manage to connect himself with a doctor from a remote hamlet who was forty years his senior? Form your own opinion on who might be the one who is exaggerating. The other point of interest is that it was not Dallas that told Holiday about the films, but an unnamed individual at Loch Ness. Indeed, Holiday states that this person told him there were not one but two films. This would appear to be independent confirmation of the films, but Holiday does not say who this person was. However, there is a clue in the text which points to Fort Augustus Abbey. We are told in Holiday's book that he and Dallas discussed a sighting by a Prior of the Abbey who was a friend of MacRae. Why would they focus on this obscure sighting? What was the catalyst for this minor topic? I suspect it was because someone at the Abbey was involved in the story of the MacRae mystery. I am only aware of one Abbey Prior who claimed a sighting of the monster and that was Sir David Oswald Hunter-Blair who was in charge of the Abbey until 1917 but returned there on other occasions. This abbot connection was not lost on Mike Dash, who wondered if such a person was the third, unnamed trustee. 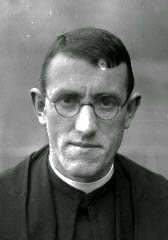 But since Hunter-Blair died in 1939, Mike concentrated on later abbots of the monastery. I myself am more focused on Hunter-Blair who was one of the Monster’s supporters during the 1930s; which is probably no surprise if he claimed to have seen it. However, Hunter-Blair was long dead before Holiday's tip off in 1965. Who could the informant have been? One could draw up a list of suspects, but my money is on Fr. Aloysius Carruth, a Brother at Fort Augustus Abbey best known for his popular booklet, "Loch Ness and its Monster". The last I heard of him was that he was engaged in missionary work in southern Africa. Significantly, perhaps, the Dallas family received a letter from a Catholic mission in southern Africa asking if the McRae film could be used to raise funds for their work. Did Carruth get wind of the MacRae film via some direct or indirect information from Hunter-Blair? The two men could have overlapped as Carruth's booklet first came out in 1939, so a conversation may have happened before Hunter-Blair died. A search of Carruth's booklet reveals nothing about the film and does not even mention Hunter-Blair's sighting. Ultimately, we won't know anything more without some new revelation. As to the Hunter-Blair's sighting, this is mentioned in Constance Whyte’s “More than a Legend” published in 1957. However, on checking the two sources stated, I don't think the sighting she refers to was actually witnessed by him. That he did see something is clearly stated in his own book "A Last Medley of Memories" published in 1936. We even read that he recounted this sighting to Pope Pius XI during an audience. But despite consulting his works and even making further enquiries to his great-great-nephew, nothing more could be gleaned concerning this sighting. For a man who was quick to promote the monster, he was fairly cagey about his own sighting - just one sentence in the whole scanned literature. I had speculated whether Hunter-Blair was present at the MacRae filming, but we won't know from his own briefest of accounts. But is it possible that the MacRae sighting is already on the record? A look at the four hundred sightings between 1933 and 1936 for descriptions of a beast that rolled like the MacRae one proved to be very rare. I found only one candidate which described a hump, long neck and rolling motion. It is a little known sighting from 15th July 1934 witnessed by a Mrs Biddle from a Fort Augustus hotel who saw the creature moving near the Abbey Boathouse. This is the extract from the Scotsman dated 17th July while the corresponding Inverness Courier article places the sighting at 9am near the Abbey boat house. The only other report which mentions the creature rolling several times is mentioned in the Inverness Courier dated 14th November 1933, but this was at noon and no neck was observed. Two other reports (6th March 1934 and 21st August 1935) mention a single roll and no neck. Comparing the Biddle with the MacRae description from Holiday, the two sightings are similar, though the Biddle one is more lacking in detail. One striking similarity is how Mrs Biddle describes the creature as resembling a huge slug while Dallas (in Holiday's book) said it reminded him of a worm. Remember also that Holiday quoted Dallas as saying there were two horn like projections on the head, which reminds us of a similar configuration on your typical slug. I don't say this because the Loch Ness Monster is a giant slug, but because the appearance of it reminded the witness of such an animal. If MacRae did indeed film the Loch Ness Monster, Was it possible that Mrs Biddle was witness to it from another vantage point further away? If MacRae was beside the Abbey boathouse with his friend, Hunter-Blair, he was in a superb position to see and film the monster. It would be easy to dismiss all this based on the erratic testimony of Alastair Dallas. But Holiday claimed someone else knew about the films and some of MacRae's living relatives seemed to independently confirm this. Something is out there, but what is not entirely clear. There are other avenues which as yet remain unexplored, those will be left for another time. As you can see, there is a network of people and possibilities, but, alas, none leads anyone to a roll of film. However, there seems to be enough testimony to some kind of image being taken that keeps the MacRae door slightly ajar. If there is still a film out there, my own guess is that with the death of the last trustee, it is no longer under a trust, but has moved into the ownership of person or persons unknown. Given the connection with Hunter-Blair, that could be a religious organisation, but who knows? The sticking point is why MacRae would withhold the publishing of such sensational material. One might think the stated reason of waiting until the subject of the monster was taken more seriously is a self-defeating tactic as such a film would surely make people take the subject more seriously. It seems that M'Rae took this matter personally, though, as the mention of "Scottish persons of repute" being treated like mental defectives, may have involved people he held in regard (such as Hunter-Blair). But the second stated reason was the distasteful expectation that those who scoffed at the monster, would then rush to profit from it, if the film was released. This is an understandable revulsion, but it is one which could permanently keep such a film from examination. Ultimately, the scientific establishment still requires a live or dead specimen and nothing is going to change that. Indeed, such a film will not persuade as many now as it would back then, especially in this age of CGI accusations. But, if there is a film, let those who stand together with Farquhar MacRae on this subject view it and let them put forward the case for unveiling it.